Looking for a Dried Raspberries Recipe? 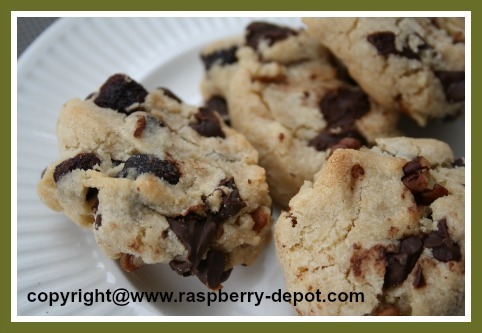 Here is a Recipe (with pictures) for Raspberry Chocolate Chip Cookies that makes the most decadent cookies using dried raspberries. Your family will ♥ love these cookies! And ... they are so quick and easy to make too! In a large size bowl, using an electric hand mixer, beat the butter and the brown sugar together until the mixture is light and fluffy. Add the vanilla, and continue to mix. Add the flour mixture and beat just until combined - do not over-mix. Fold in the chocolate chips, pecans and the dried raspberries. Drop the cookie dough onto cookie baking trays (I used cookie trays with parchment paper lining), about 2 inches apart. Bake at 350° F for about 15 - 20 minutes, or until puffed and golden. Cookies may still be soft to the touch in the center and look under-cooked, but they will harden as they cool. 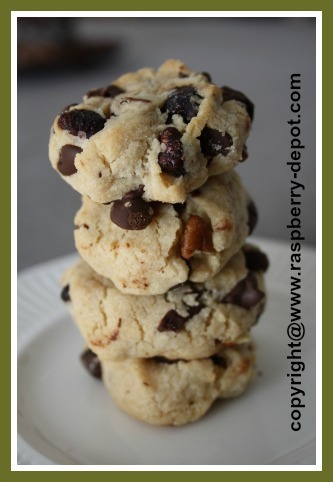 Make about 2 - 2 1/2 dozen delicious raspberry chocolate chip cookies! VARIATION - you can easily substitute the chopped pecans with macadamia nuts or walnuts. 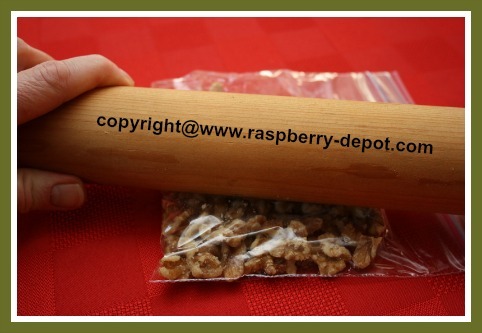 If the nuts you have on hand are not chopped, simply place them in a plastic bag or between a fold piece of waxed paper, and go over them several times with a pastry rolling pin.